The Pro All Stars Series (PASS) proudly announces the first season of the new Outlaw Late Model Series starting in 2006. The new Outlaw Late Model Series offers these competitors a viable option of fast, competitive pro stock racing with equipment that they currently own under a set of flexible and inclusive rules that allow a variety of engine and body combinations to race together in a series that doesn’t conflict with weekly Friday or Saturday night shows at their local tracks. It also gives young racers the opportunity to get their feet wet in touring and the demands of different tracks as they look to move up to higher divisions like the PASS Super Late Model/Pro Stocks. The objective is simple: To bring racers and fans back to the track. We thought that racers who have been forced out of their weekly tracks and cannot afford the travel and expense of the PASS Series are out there. We are sure of it now. We have been very pleasantly surprised by the number of teams from throughout New England that have requested information and have asked about specific car numbers for the series, especially teams that do not currently compete at any weekly tracks. We did two “test” races at Beech Ridge in September and at Canaan in October with full fields of cars from ME, NH, MA, RI, and VT. So, we now know that the interest is genuine across the entire region and with all types of late model and two barrel pro stock cars. schedule should be completed shortly. Travel will be limited, and they will all be one day shows, except the Beech Ridge PASS 400 Weekend in September. 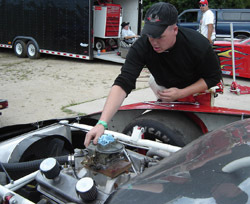 The rules (click here for rules) are based on the two-barrel wet sump motor cars that have run as pro stocks and late models throughout New England. There are spec engine options for the 385 and 400 series Fast Burn motors, the ZZ4, and other spec motors. There are rules for a variety of bodies including the Outlaw wedge body. There is a shock expense rule and other cost containment rules. If you have any questions, call Scott Reed at 207-625-3230 between 6 and 9pm. The success of the PASS Super Late Model/Pro Stock Series in the last five years and the growth of the PASS Modifieds over the last two years have drawn many racers and fans to the racer- and fan-focused approach of PASS racing. This new series has grown out of the desire of many weekly pro stock racers who have seen their local tracks drop the pro stock division in an attempt to reduce their costs, and rather than convert them to a lower division, they have parked their cars. Others have expressed a desire to run with the PASS Super Late Model/Pro Stocks but do not have the budget to compete at that level or to handle the expense of touring to the extent that the PASS Series demands. The new class will allow drivers like Mike Murphy, shown here testing an Outlaw LM earlier this season, to step up from the local tracks to a touring series.